2K has confirmed that Borderlands: The Pre-Sequel will release on October 14th in North America for Xbox 360, Playstation 3, and PC. The game will be out internationally on October 17th. This is Gearbox’s newest entry in the series and is set in between the first and second game, taking players to the low-gravity setting of Pandora’s moon. I’m excited to see what the jetpacks and other low-gravity features bring to the game, as it could provide some nice twists to the familiar formula. Those who choose to pre-order The Pre-Sequel will receive the Shock Drop Slaughter Pit bonus content. NEW YORK–(BUSINESS WIRE)–2K and Gearbox Software announced today that Borderlands®: The Pre-Sequel™, the next standalone game in the wildly popular Borderlands franchise, will be available in North America on October 14, 2014, and internationally on October 17, 2014, for the Xbox 360 games and entertainment system from Microsoft, PlayStation®3 computer entertainment system and Windows PC. Currently in co-development with Gearbox Software and 2K Australia, Borderlands: The Pre-Sequel is set in between the award-winning Borderlands and Borderlands 2, and brings low-gravity shoot ‘n’ loot mayhem to Pandora’s moon for the first time. 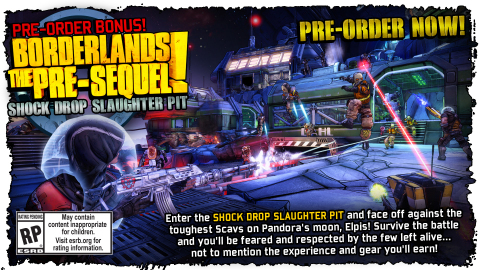 Additionally, those who pre-order the game through participating retailers will receive the Shock Drop Slaughter Pit bonus content, which features intense zero-atmosphere combat against the fiercest enemies Pandora’s moon has to offer, and rewards players with unique in-game loot. Gamers who pre-order Borderlands: The Pre-Sequel will gain access to the Shock Drop Slaughter Pit bonus content. Taking place in an old Dahl facility on Pandora’s moon, players will meet TR4-NU, who once was one of Dahl’s military recruiters until he went crazy. TR4-NU is now hosting the Shock Drop Slaughter Pit and giving awesome loot to those who succeed against the moon’s toughest enemies. 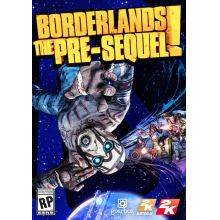 To pre-order Borderlands: The Pre-Sequel, please visit http://borderlandsthegame.com/index.php/retail/borderlands-the-presequel. Borderlands: The Pre-Sequel will be available on October 14, 2014 in North America and on October 17, 2014 internationally, for Xbox 360, PS3™, and Windows PC. Borderlands: The Pre-Sequel is not yet rated by the ESRB. Watch the first trailer for Borderlands: The Pre-Sequel at https://www.youtube.com/watch?v=xe6oobNa_RA. For more information, please visit the official Borderland web site, follow @borderlands on twitter, become a fan of Borderlands on Facebook, and subscribe to the new Borderlands channel on YouTube.